Unfortunately, there is trouble brewing in her life as a paranoid wood elf is convinced she is plotting against him. Bernadette has realized that something is amiss and when asked about Glarthir will say, "Well, I know he's a bit odd, but I've always thought he was kind of sweet. Lately, though, he has been stranger than usual. I think maybe he's been following me. I see him every morning on my way to Chapel. I've tried to say hello but he always pretends not to hear me." The situation is left for the player to resolve. If you deem Bernadette guilty, she will be added to his List of Death. If you confront her with the list in hand she will get quite nervous: "You look concerned. Is there something you want to tell me about Glarthir?" When you show her the list she will be terrified: "Julianos preserve us! I can't believe it ... why me?! Please, show this to the guards right away!" If you ask her about Glarthir again she will add: "Thank you for warning me about him. Please, hurry and tell the guards before it's too late!" 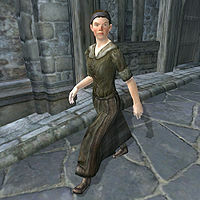 If, however, you decide to reject Glarthir's note, Bernadette will join the People Glarthir Hates faction and will soon be attacked in her sleep by a wood elf armed with an iron war axe. If Glarthir succeeds, the upset townsfolk will start to say: "Hadn't you heard? He went crazy and killed Bernadette Peneles, poor girl."